Perhaps you have always wanted to record yourself or your band. Now is the perfect time to learn how you can do it. We'll show you the most cost effective ways to get your music heard. Home recording is one of the fastest expanding areas of the music industry. Every year, companies create new programs, enhance already existing programs, and engineer more interfaces so you can create higher quality music from the comfort of your home. What does this equate to? You being confused and intimidated because the chances are, you have no idea how to use it. Unfortunately, the home recording industry has been regarded as extremely complex. The truth of the matter is that while recording music is as much an art as it is a science, anyone can do it. All it takes is a little ingenuity and a lot of dedication. On the other side of the spectrum, cost has been a huge factor that has held many great musicians back from recording from their home. Just four years ago, the cost of home recording equipment was astronomical. It made more economical sense to rent time from a professional studio and hire someone who knew what they were doing instead of trying to do it yourself. Now the times have changed and so have the prices. Depending on what you are looking to do, you can put together a decent recording studio from $100 all the way up to $2000. That's quite a difference in price, which is why you need to know the basics before you walk into your local music store or head online to ebay. The reasons why you would want to take the time, money, and effort to record yourself vary from musician to musician. Recording yourself is a great way to analyze your sound and technique so you can hear where you went wrong in a particular piece of music. Home recording is also a great way to create a demo of your band and/or produce an audition CD. My personal reasons to venture into the world of home recording were for work and personal enjoyment. It's extremely fulfilling to put hours into a project and see the final result come to life. If you think you need a full band in order to make a song sound full, you would also be incorrect. With the great technology out there and MIDI (more on that later) you can be a one-man-band. It's a fantastic way to fine tune your ear and get valuable production experience. In order to get off on the right foot, there are some things you should look at buying before hand. This article is assuming that you already have a home computer or laptop. If you don't, we'll cover some options for you later. 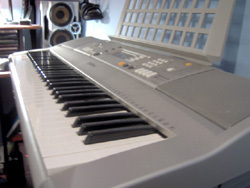 Your computer can be viewed as the heart of your home recording studio. It's what runs your software and what transmits the signals from your instruments into your computer so you can transform them into a song. 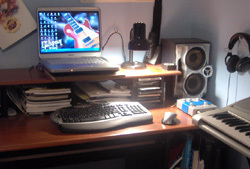 A computer also allows you to create CDs, which is essential if you are looking to share music with friends, family, or fans. Now, you may be looking at your computer and thinking, "Gee, I don't see any ports that fit my guitar cable or tell me where to put it." The reason why you don't see anything is because there isn't anything there at the moment. This is where a sound card or interface comes in. ...The above image is of a nine pin serial port. They come longer than that as well depending on the type of card. When you buy a connector it should come with all of the proper jacks. The most important ones to have are a 1/4 inch jack for your guitar, one XLR for your mic, and two midi ports. This sounds complicated but simply walk into your local music store or Radio Shack and explain that you need a connector for your sound card and it won't be an issue. Click here to check out some great sound cards. If you are serious about getting some great quality music, you may want to look at upgrading your soundcard. 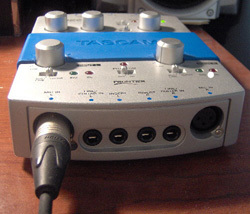 However, if you're anything like me, the soundcard is far too much work. With the possibility of a new sound card installation, finding the right connectors, and knowing what you already have, it can get complicated. While soundcards are the most inexpensive, the next option is only slightly more and makes life far easier. Using an interface is what I like to call " plug and chug home recording." ... As a huge bonus, many of the companies that make these interfaces partner with software companies to make bundles. This means that you kill two birds with one stone because you get your software and interface at the same time. In the long run, this can actually become more affordable then the sound card option due to the bonus software that comes with the interface. If you were to buy the software separately, you would end up paying roughly the same amount minus the great interface. In the end it comes down to personal taste. There are two categories that mics fall into, dynamic and condenser. Dynamic mics are great for high sound levels such as guitar amps, wind/brass instruments, loud vocals, snare drums, and kick drums. They are the perfect mics to start out on since they are relatively inexpensive and are extremely versatile. Condenser mics are far more sensitive and are great for acoustic instruments, cymbals, and vocals. While you can get condenser mics for live performance, a large diaphragm condenser mic is perfect for home recording vocals. Unfortunately, condenser microphones can cost upwards of $400 and unless you have the money, aren't practical to start off with. You can get a good quality dynamic mic for roughly $100. They are worth every penny. I strongly suggest investing in a Shure SM57. It's probably one of the most famous dynamic mics in the world. It offers superb sound quality and can be used for amps, wind/brass, and vocals. It is the perfect mic to start with. 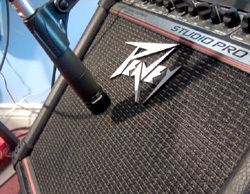 To the left you can see a Sure SM57 in action on a guitar amp. It replicates the sound perfectly which is nice when you are trying to get a pure tone. Condenser mics are a great addition to any home studio. The reason we don't use them for guitar amps or saxophones often is due to the fact that they crack the signal because they are so sensitive. You will soon find out that you have hundred of options available to you in the world of microphones. While I could write for weeks on the subject, I'll leave you with one more important detail. You can choose from directional and unidirectional mics. Directional will only pick up noise from what it's pointed at while unidirectional allows other sounds to enter the mic. Both have their pros and cons. Generally, you won't have too many problems with an unidirectional mic. 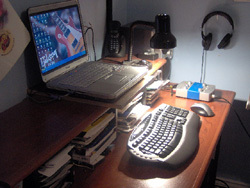 There are many types of software available that will help you to record via computer. Some of the most popular brands include Cubase, Sonar, Cakewalk, Sony Sound Forge, Apple Logic, and many more. The options are limitless. Most of the above software ranges from $200-$400. However, you can get other versions of the above software with an interface if you shop around. That will save you a tonne of money. They all have a steep learning curve. My best advice to you is read the manual. The manuals are designed to build you from the ground up and are extremely useful when you get stuck. Each software package is similar in the sense that they all have many of the same features that you would find in a professional studio. You can achieve excellent results with all of the above programs. MIDI is an acroymn for Musical Instrument Digital Interface. It hooks up to your keyboard and send a signal with vital information to your computer software. It is not an audio signal, rather a device that sends data back and forth from your keyboard to your computer. It tells your computer what note you are hitting, when you hit it, how hard you are hitting it, when you let that note go and moved to another note, and when you changed a program. When all of that information enter your computer, it is processed. All MIDI data is completely transformable. This means that you can make those notes sound like a piano, violin, or even an orchestra! Once you assign the sound you want for the data, it is played back and recorded into a track. Now you can add more tracks of midi and create your own band from your keyboard. While it takes practice, MIDI is an extremely useful tool for anyone who has a passion for music. You can arrange musical masterpieces for orchestras or find that unique sound to add to your song. If you don't have a computer, or prefer to keep it simple, there are still plenty of options available to you. Depending on your budget, you can get a four track tape recorder with mixing capabilities and great quality for as little as $100. For those who want more options, you can get upper level consoles that make CDs. They tend to range between $600-2000. You may not have as many options with the four track tape recorder but they get the job done. They have the ability to record mics, guitars, vocals, and much more. They are a great alternative and recent developments in technology allows companies to deliver professional level equipment to the average consumer. Another great aspect of these units is their portability. You can travel anywhere and record wherever you want. Try taking your desktop or a laptop with the rest of gear somewhere remote. It's not easy. Keep in mind that these consoles are not the kind your grandmother used. They are made specifically for home recording and are dependable. The only downside is that you cannot upgrade the technology without buying all new equipment, unlike software which is easy and relatively cheap to upgrade. Once you have the gear, you need the room for it. Ideally, everything should be able to fit into a small office or bedroom. The quieter the location, the easier it is for you to get better recordings. As odd as this sounds, the deader the room acoustically, the better you are. Some musicians think the more echo and the bigger the room the better. This simply isn't the case for recording, only live performance. When recording at home you want to add all the effects with your software and have no outside interference. With all of that said, here are some pictures of my recording studio located in my office. Everything recorded for our Guitar Tips newsletter is recorded via this system. Let's face it, there is far more to know about recording then meets the eye. With many technical details and setup issues, it can be a daunting task without some help. TweakHeads.com makes learning everything you need to know about home recording easy. In fact, they make it enjoyable! With step-by-step tutorials and helpful advice around every corner, you can easily achieve success with recording. One of the many greatest aspects of this learning tool is the variety of readers it caters to. Whether you are investing in a $100 studio or a $3000 studio, there are lessons that pertain to your needs. Regardless of your skill level, you can find superbly crafted instruction. If you want to know about Podcasting, producing, mixing, MIDI, soundcards, Mac vs. PC, or anything else you can think of, you'll find it here. The site has a fantastic layout with easy access and no popups! Furthermore, TweakHeads.com offers their services at no cost to you. They even offer an online forum just in case something doesn't quite click in with one of their lessons. How do I know that this site works as well as I say it does? I know because it's what I personally used to get a grip on making professional level recordings.